This week The Color Room presented their 50th Colour Palette. Along with the palette they presented a Blog Hop to all of the DT's blogs. I had so much fun completing the blog hop and got soooo many good ideas that I wanted to try in a LO. "Once Upon A Time" - Title was done using Kaszazz stamp with Tim Holtz distress ink - Faded Jeans. I then went over the words with a small dose of Crackle Accents by Ranger. I used some white embossing powder to emboss the Magnolia stamp (by Kaszazz) and then sprayed the area with Smooch Spritz - Sea Kiss. I also created so sploches using watered down paint & a straw (this idea came from the blog hop). I added a few hand cut butterflies to the rolled area to create a little more detail. I wanted to note the age of this photo...... it is my Grade 1 photo taken in 1989 - I used small alphabet stickers in order to do this. I wanted to give a little something extra to the rolled back area and therefore placed a strip of sticky bling along the edge of the roll. A better view of the sticky bling. I created the laced section with some small eyelets and some navy blue satin ribbon. I have used some lace under the photo, this lace was originally white and I used the watered down paint to add some colour to it. I have also used a script stamp and Faded Jeans distress ink to add some more dimension to the background. I have used 2 different papers to mount the photo - this paper was wet and crumpled - then opened back up and dried out. I am just loving Prima at the moment and have used some Prima flowers and pearl accents - there are also a few miniture roses in the flower cluster. I have also cut out a butterfly and added it to the cluster. 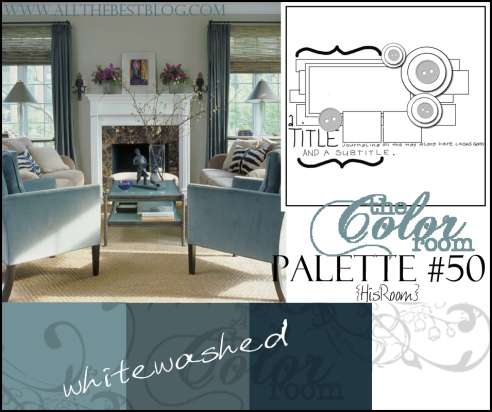 If you would like to join in the Blog Hop or see what the other talented ladies have created for this Palette head on over to The Color Room and check it out. Don't forget to become a follower and join in my Blog Candy giveaway while you are here. Hi Samantha. What a great page. My Daughter is Mykenzie too!!! Fancy that. So glad you enjoyed the Hop. It was lots of fun!